It started with a conversation over birding. Having been raised to share love of bird-watching with her dad, my daughter was casually checking out a few species when she mentioned she wished she had her binoculars with her. That’s when I told her, “Did you know that some people can identify birds with other senses besides sight? If you were blind, what would you use to learn about birds instead?” This led to watching the video entitled, “Blind Birdwatcher Sees With Sound,” followed by all the other videos I recently included in an inquiry into the senses. All this led to a fascinating conversation about the senses, absolutely packed with “aha moments” for my daughter. The baby video in the above-mentioned post particularly made us think together — we ended up talking about how important sensory experiences are for kids. That’s when she made the connection to why we call our bin filled with dry grain a “sensory box,” as well as other items in our home that she suddenly realized were deliberate choices based on her parents’ understanding of child development. All at once, and to her delight, she was “in on the secret” on her own development as well as that of her brothers. She started to not only recognize but make suggestions to her environment when it comes to providing sensory experiences (particularly keen to share her pearls of wisdom on bettering her little brothers’ experiences). And quite apart from the learning element from it all, it has simply been a wonderful relationship-builder as well. What does “letting kids in on the secret” look like at school? …teaching kids to recognize their own time-use and purposes, and then gradually providing them with opportunities to exercise agency in how they spend their time (such as in this Daily 5 example). …frequently talking about the why behind everything we do! What about you? What are some ways you have “let students in on the secret?” What has been the impact when you see students with a greater understanding of the big picture of school? Counting popsicle sticks. Singing songs about weather. Chanting the days of the week. The Calendar Time routine has become a veritable staple in many PreK-2 classrooms. Which is why I don’t make this challenge lightly. But between research and my own observations, I can’t help but wonder whether Calendar Time is pulling its weight proportionate to its allotted time/energy. Developmental readiness, especially with regards to temporal understanding (“According to Friedman (2000), the ability to judge the relative time from a past event or until a future event in terms of the calendar year is not in place until sometime between 7 and 10 years of age”). The skills we work to cultivate during calendar time are often better suited toward guided group/individual work that is more easily differentiated. I witnessed just how valuable the alternatives can be in watching my own daughter’s temporal development unfold. When she was about 4 years old, I noticed that she could never keep track of how soon events would occur — life became an endless stream of questioning to find out how many days before _____. 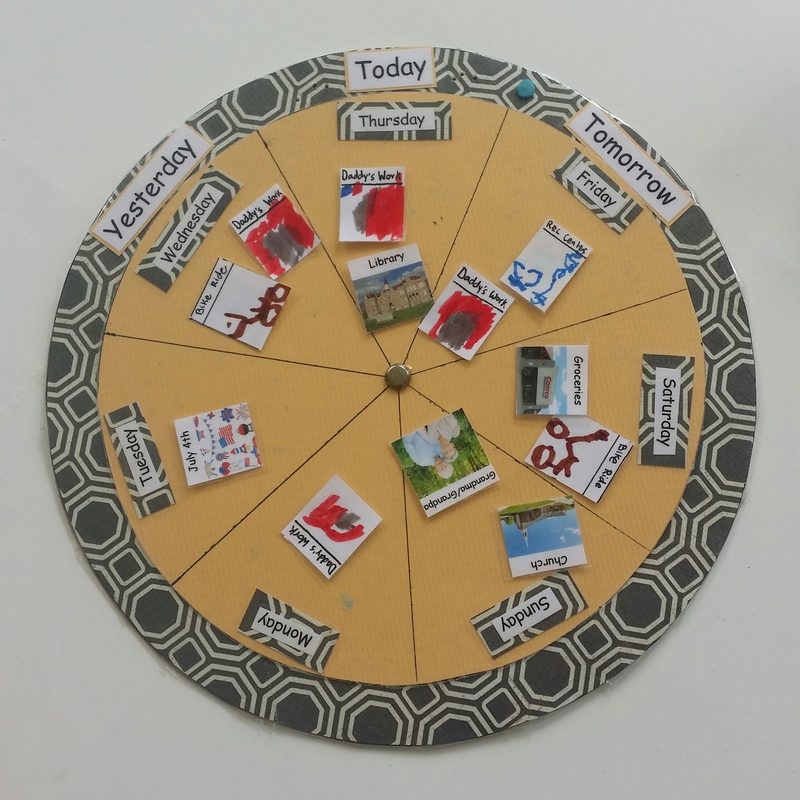 In response, I decided to create for her what we called our “week wheel,” on which we stuck pictures of frequent events (which she illustrated, of course). Quite apart from saving my sanity, this handy tool also provided a hands-on method for her to better comprehend what comes next. More recently, she started asking me what day of the week it was — every single day. For a long time, I didn’t think much of it; I dismissed it as simple curiosity. 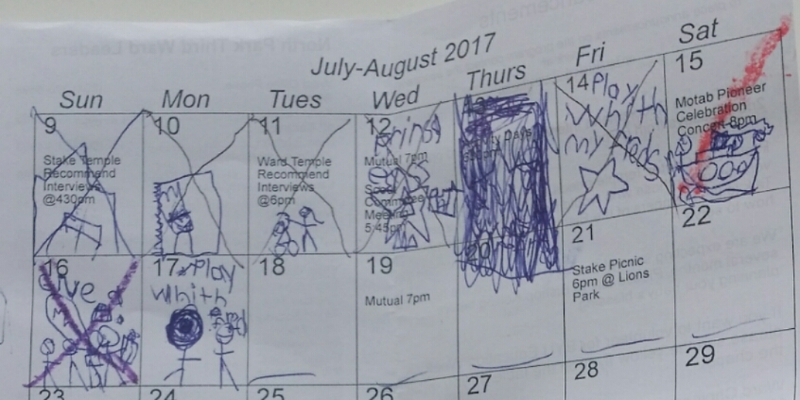 Until I realized that she was creating her own picture calendar out of the one included in the weekly bulletin at church. Each day, as soon as she heard the name of the day, she’d dash back in to check what she’d planned for herself for the day, meticulously crossing off the day before. Honestly, I can’t think of a better way for her to learn the days of the week than this kind of authentic, personal application. Obviously, such strategies become more complex when there are 20-30+ kids in the mix — a whole-group Calendar Time seems sensible. But what seems more efficient isn’t necessarily going to be effective. We can and must get creative to find ways to meet our kids where they are in all their diverse needs and interests. During our big summer project (building a deck! ), I decided to let my daughter jump in with the painting. I thought it would be a simple opportunity for her to experience some ownership over our project. Turns out, it was much more. For one thing, her questioning was endless. The difference between primer and paint, the purpose of even brush strokes, the relevance to the overall design, and so on. For another, she identified several valuable life lessons. My favorite was when she told me, “You know, things aren’t always as quick and easy as they seem. I thought I’d finish painting this board in just a minute or two!” It was also wonderful to help her observe the patient, and often tedious, preparation that is required for a job well-done. As I reflected later on, I recognized the richness of that learning experience. Her critical thinking, reasoning, communication, and comprehension skills were sharpened again and again — with a depth and authenticity that all those summer workbooks can never even come close to matching. In my community, the public library, local schools, and local university all offer programs designed to help kids access authentic learning experiences. And it is delightful to watch that access grow all the time. Whatever our circumstances, we should always be on the lookout for experiences that will help our children make connections and cultivate skills — and no matter how simple, personal interactions go a long way.